Reviewing any modifications to the Navajo 9-1-1 Distribution Formula. Approving any Memorandums of Agreements (MOA) with neighboring political entities and/or emergency service responders. Promulgate rules concerning 9-1-1 dialing capabilities of multi-line telephone systems (Legislative Authority Needed). Study and report to the Commission on the overall costing, funding and billing issues of providing 9-1-1 service, including the 9-1-1 surcharge, tariffs, and PSAP equipment costs. The voting membership of the Committee will consist of representation from PSAPs, Dispatch centers, Telecommunications Carriers, Public Safety, EMS, Fire Departments and representatives of other stakeholder groups appointed by the NNTRC. Examine decisions to be made concerning the transition to NG 9-1-1 technology. The voting membership of the Committee would consist of Chapter Officials, Council Delegates, County representatives, local municipalities/townships, etc. and appointed by the NNTRC. Prepare necessary reports for the NNTRC and Oversight Committees relating to response statistics. In the long term the Navajo 9-1-1 Resource Center should become the independent legal entity designed to carry forward the mission of Navajo 9-1-1 Program. The Navajo 9-1-1 Fund is a revolving fund account that would be primary account for funding the Navajo 9-1-1 Program. The primary source of funding for the Navajo 9-1-1 Fund would be the Telecommunications Navajo 9-1-1 Surcharge removing the any state 9-1-1 Surcharge appearing on eligible phone bills on the Navajo Nation. The Navajo 9-1-1 Fund may also be allocated funding from other sources such as BIA Federal Funds, USDA 9-1-1 Loans, State 9-1-1 Programs, and the Navajo Nation Council. The Navajo 9-1-1 Resource Center would be the primary department charged with the of distribution funds to eligible mechanisms within the Navajo 9-1-1 program. The overall governing mechanism for the Navajo 9-1-1 Fund is the Navajo 9-1-1 Distribution Formula. For use by the NNTRC Office for the Navajo 9-1-1 Program. The Fund Management Plan shall be approved by the Law & Order Committee, and the Health, Education & Human Services Committee, and the Budget & Finance Committee of the Navajo Nation Council. The Navajo 9-1-1 Distribution Formula shall be created and updated by order of the NNTRC, and approved by committees of the Navajo Nation Council. The Navajo Telecommunications 9-1-1 Surcharge is create by the Navajo Nation Council to contribute to the Navajo 9-1-1 Fund. The Navajo Tax Commission shall collect the tax from telecommunication providers that have registered with the NNTRC and have a valid NNTRC Certificate of Convenience and Necessity (CCN). The Navajo Telecommunications 9-1-1 Surcharge shall be adjusted appropriately by the NNTRC with approval by the Oversight Committees. The Navajo 9-1-1 Distribution Formula is the created by Order of the NNTRC for governing the allocation percentage of funds to programs within the Navajo 9-1-1 Program. The NNTRC should be the primary entity for determining the distribution of funds, but the oversight committees would have the ability to review and/or disapprove any revision. 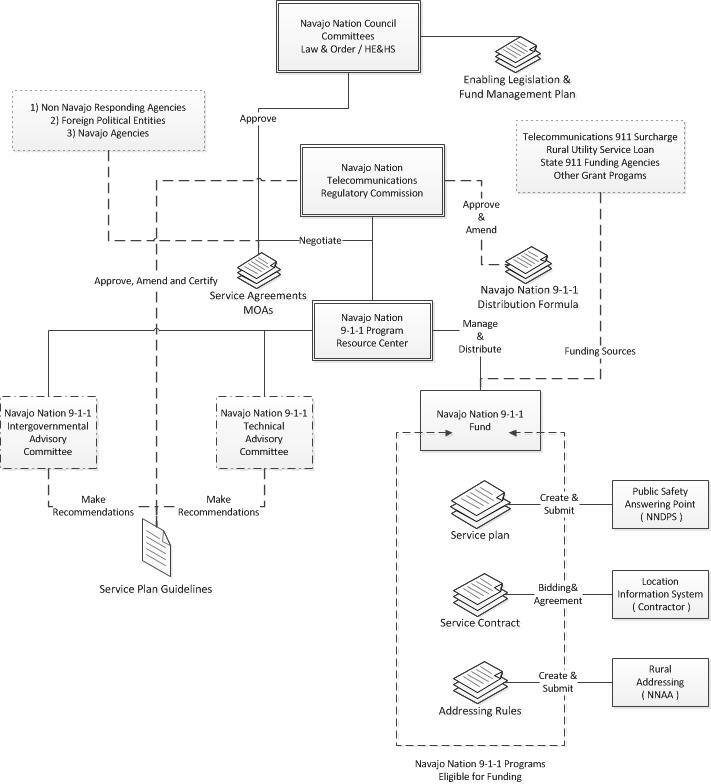 The PSAP Service Plans is the document developed by NNDPS or any other interested qualifying party with the assistance of the Navajo 9-1-1 Resource Center that outlines the Standard Operating Procedures (SOP) for providing 9-1-1 Service to the Navajo Nation public. The Service Plan document outlines the obligations, actions and vital information of the PSAP. Based on the PSAP Service Plan the Navajo 9-1-1 Resource Center would administer appropriately funding and ensure compliance with the approved Navajo 9-1-1 Service Plan Guidelines. 9-1-1 Navajo Program may fund only one PSAP, although in some cases one 9-1-1 authority funds multiple PSAPs. A PSAP may, in turn, take 9-1-1 calls for and dispatch calls for service for multiple political entities and responding agencies. The Division of Public Safety will be the primary operator of PSAPs for the Navajo Nation by providing facilities, personnel, and security. The NNDPS may apply for reimbursement or direct funding of PSAP functions allowed by the NNTRC for operations of the PSAP. The PSAP shall operate as the first point of contact for all emergency calls. The Jurisdictional issue shall remain solely with NNDPS and NNTRC would not be concerned with issues of jurisdiction but rather, the NNTRC will impose obligations on coordination on response for emergency service. These obligations would be submitted as part of the PSAP Service Plan. The NNTRC would require the PSAP to update all information and keep MOAs current with surrounding PSAPs adjacent to the Navajo Nation. The Master Street Addressing Guide (MSAG) is a key component for location information services for all PSAPs when a call is routed to a PSAP. The MSAG should be made available to all entities that may work in coordination with the PSAP in order locate the parties requesting emergency services. The Navajo public has voiced concerns with privacy of this information. The NNTRC under its current authorities can set privacy rules under Navajo Nation law to protect the information from being distributed unwillingly or reasons unrelated to public safety and/or emergency response. Under the current organization and capabilities of the Navajo Nation, it is likely that portions of the Navajo 9-1-1 Program should be outsourced to firms experienced and capable in delivering, protecting, and updating the MSAG data for the Navajo 9-1-1 Program. The Addressing standards adopted and promoted should be in the best interest of locality and responders. The NNTRC with authorization could be able to promulgate rules for addressing schemes and adopt exceptions if warranted. The NNAA would make recommendations, as part of the Navajo 9-1-1 Technical Advisory Committee, for the type of addressing scheme to be used for an area, but the NNTRC would have the authority to authorize an alternate standard by order. The Rural Addressing Department would be the primary agency responsible for assigning the address to a resident or commercial property on the Navajo Nation, and is responsible for reporting that information to the proper agency for assignment into a database for 9-1-1 locations purposes.